Good blood flow is essential for proper brain function and oxygen transport to vital organs in the body. Because your heart is the pump that keeps your blood circulating, it's important to maintain a strong heart. Eating a diet rich in heart-healthy foods is one way to help ensure that your body experiences efficient blood flow. L-arginine is an amino acid that your body converts to nitric oxide, a substance that helps relax and maintain the elasticity of blood vessels and arteries. Nitric oxide is also a signaling molecule that instructs arteries to dilate, or widen, which allows blood to flow more freely, helping reduce blood pressure and promoting cardiovascular health. According to Don Colbert, author of "The New Bible Cure for High Blood Pressure," good food sources of L-arginine include chicken, fish, soy nuts, beans, dairy and red meat. If you have high blood pressure, talk with your doctor before taking L-arginine supplements to ensure proper dosage for your condition. Vitamin E, a fat-soluble vitamin, plays an important role in efficient blood flow because it dilates blood vessels. Eating foods rich in vitamin E is a good way to keep your blood moving, according to Sherry Torkos, author of "The Canadian Encyclopedia of Natural Medicine." 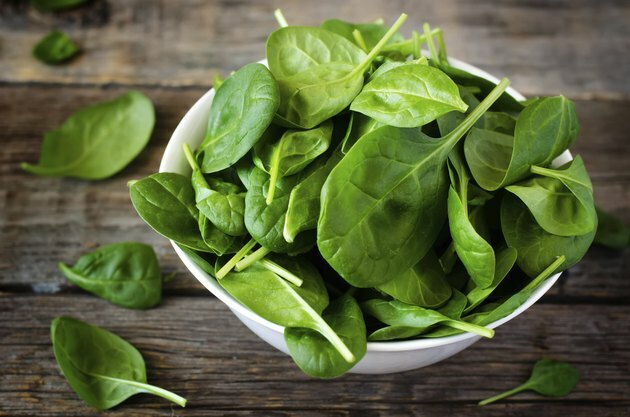 Good food sources of vitamin E include nuts, seeds, whole grains and leafy green vegetables. If you're taking blood thinners, talk with your doctor before taking vitamin E supplements because they may increase the risk of bleeding. Omega-3 fatty acids keep your blood flowing. People with blood-circulation problems such as varicose veins, for example, benefit by eating foods rich in omega-3 fatty acids because these unsaturated fatty acids stimulate blood flow and help break down fibrin, or blood clots, according to Shubhangini Joshi, author of "Nutrition and Dietetics." Good food sources of omega-3 fatty acids include nuts, olive oil, canola oil, flax seeds and oily fish such as salmon, tuna, sardines and herring. Atherosclerosis, a disease in which your arteries become clogged and hardened, is the underlying cause of most cases of heart attack, stroke and vascular dementia. About 80 percent to 90 percent of Americans over age 30 have atherosclerosis, according to the University of Maryland Medical Center. This buildup narrows arteries, making effective blood flow difficult. Eating a diet rich in fruits, vegetables and whole grains, which are low in saturated fat and high in fiber, helps prevent plaque buildup and supports good blood flow.